As an AromaTouch® Technique practitioner, my goal is to provide the ultimate relaxation experience while enhancing the availability to your body of the clinical benefits of CPTG (Certified Pure Therapeutic Grade) Essential Oils. ATT stimulates blood flow and neurological activity by working along known body meridians, which enhances the effectiveness of the essential oils. For ATT, I use only dōTERRA CPTG Essential Oils because they are pure, safe, and scientifically proven to be effective. In addition to the therapeutic benefits of essential oils, a big part of ATT is the touch aspect. The human touch, when experienced in a gentle and loving way, triggers the release of oxytocin in the brain. Oxytocin lowers the heart rate and cortisol levels (cortisol is responsible for stress, high blood pressure, and heart disease). Touch also triggers the neurotransmitter, dopamine which, in addition to regulating a host of important functions within our bodies, also regulates our moods and ability to enjoy our lives. Today, unfortunately, many of us live a touch-deprived existence. Nowhere is this more prevalent than among seniors and the increasing numbers of people living alone. The consequences of this relatively modern phenomenon is evident in the rise of a host of ailments plaguing the general population, including depression, anxiety, heart disease, and many other stress-related illnesses. While diet and exercise play an important role in achieving and maintaining optimal health, from a holistic point of view, human touch is also important. By integrating essential oils and gentle massage, ATT offers a winning combination that is perfect for elevating the body, mind, and spirit. Be sure to book your appointment today, and experience this wonderful healing modality. 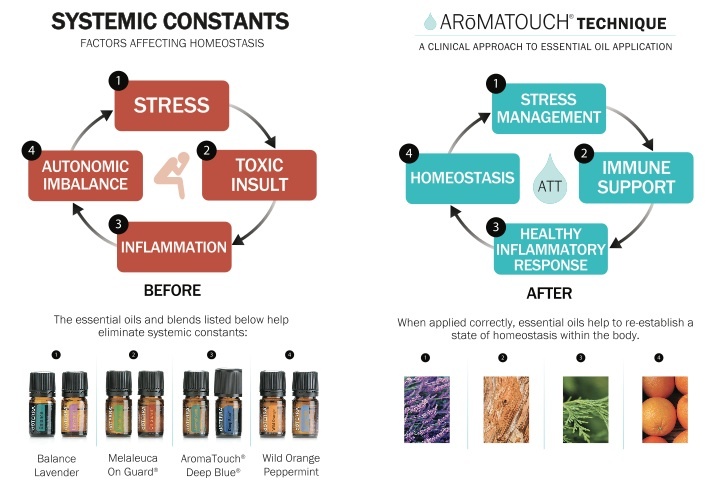 Below is a short video by dōTERRA International that describes some of the benefits of AromaTouch® Technique, and how it is performed. AromaTouch from dōTERRA International on Vimeo.